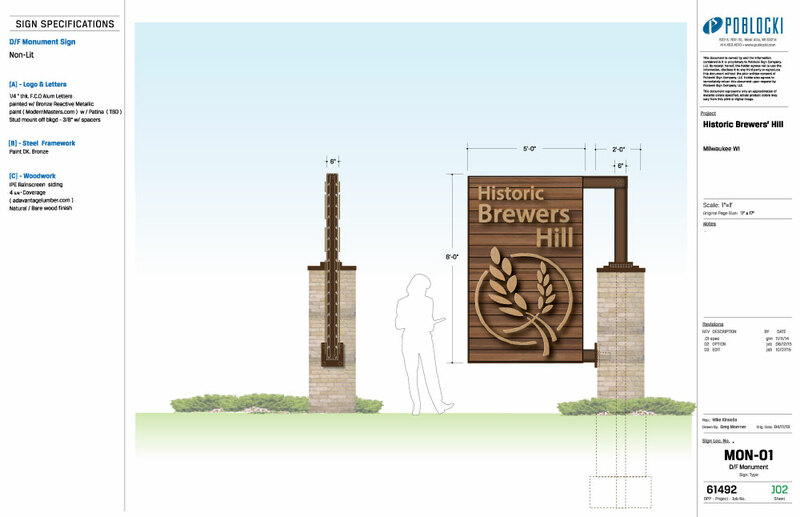 Beginning in 2011, the Historic Brewers Hill Association (HBHA) embarked on the Gateway Signage Project to establish monument signs and banners at key intersections throughout the neighborhood. 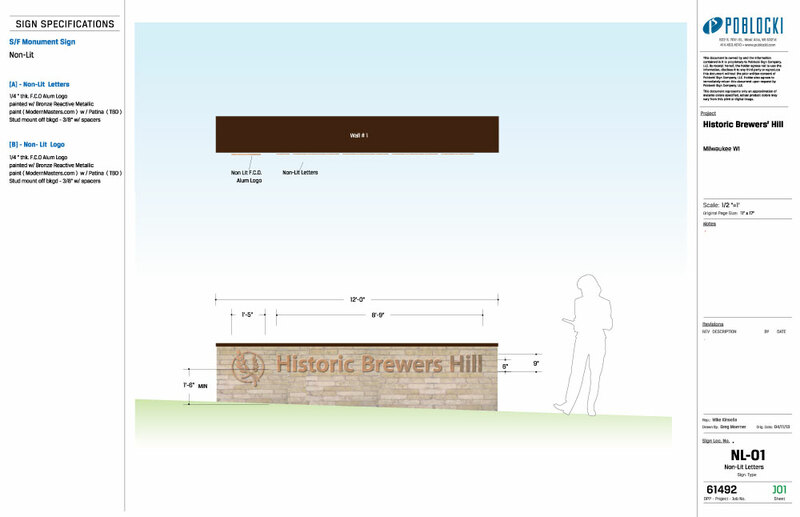 To begin this project, HBHA commissioned Community Design Solutions (CDS) to produce a report on conceptual design and location of signage for the Brewers Hill neighborhood. Over the course of two years, HBHA engaged neighbors to fine tune the design and location of Phase I Gateway Monument Signage and through numerous fundraising efforts, Phase I was unveiled amongst many residents, businesses, corporate sponsors, and local City and State representatives on December 10, 2015. 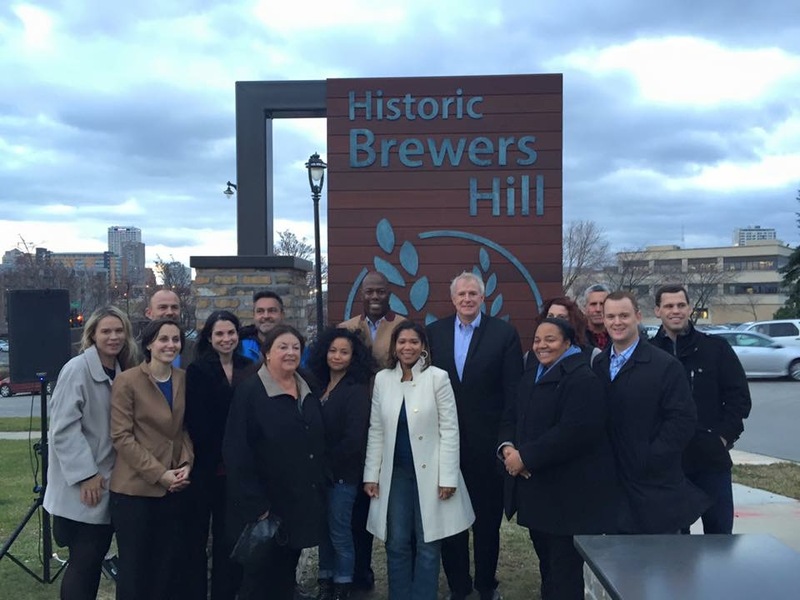 The Phase I monument signage is located at the northeast corner of Pleasant Street and Palmer Street, a site designated as the primary entrance to the Historic Brewers Hill Neighborhood. Original design concepts of the monument signage credited to CDS; Phase 1 monument signage designed & installed by Poblocki Sign Company. In 2016, the HBHA began pursuing Phase II of the Gateway Signage Project which focuses on street sign toppers and neighborhood identification signs on street poles throughout the neighborhood. Fundraising, procurement and installation of Phase II is anticipated in 2017. Original design concepts credited to member Scott Carlson. 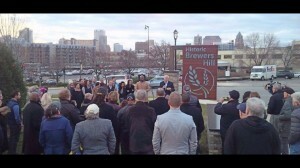 Mayor Barrett unveiling the Phase I Gateway Monument Signage on December 10, 2015. HBHA Board of Directors with Signage and Host Committee members, Mayor Tom Barrett, Alderwoman Milele Coggs, and State Senator Nikiya Harris Dodd.